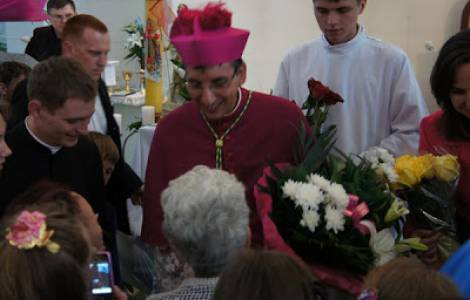 ASIA/KAZKHSTAN - The Bishop of Almaty: "A year dedicated to the Sacred Heart of Jesus: catechesis begins in Kazakh language"
Vatican City (Agenzia Fides) - "The Church of Kazakhstan and Central Asia has changed little structurally in the last five years, but we are thinking that it could grow a little bit more. We still do not know how, but we have this desire and we hope to find inspiration for the work of evangelization. At the same time, we are living these days with great enthusiasm: I believe that for each of us this visit to the Holy See must not be an administrative journey, but a pilgrimage of spirituality and communion". This is what José Luís Mumbiela Sierra, Bishop of Almaty, says to Agenzia Fides in Rome on the occasion of the ad Limina apostolorum visit of the Bishops of Central Asia, which is being held from 25 February to 4 March. Mgr. Mumbiela explains the situation of the Catholic Church in Kazakhstan which, according to data from the Congregation for the Evangelization of Peoples, counts 112,500 Catholics divided into four dioceses (Astana, Almaty, Karaganda, Apostolic Administration of Atyrau): "Christian life continues, let's continue our path of growth. In the diocese of Almaty in this 2019 we have on the one hand the idea of creating some new parishes, on the other that of giving life to new pastoral and charitable projects. Moreover, we will dedicate this year to the Sacred Heart of Jesus: it will be a moment of spiritual character, but also of formative growth, which will aim to know the heart of Christ in order to know the human heart better. In these activities we will have the support of two new priests who will arrive in the coming months", explains the Bishop. Moreover, the faithful of the diocese of Almaty will be supported also by models of holiness linked to the history of the local Church. Mumbiela continues: "We asked a Kazakh painter to paint a picture dedicated to Franciscan minor friars who died martyrs in the fourteenth century in what is currently the border between Kazakhstan and China: there was an ancient diocese, whose headquarters are currently in Chinese territory, but bears witness to the historical presence of Catholics in Kazakhstan. This serves as a reminder that our faith is not only linked to the arrival of Germans and Poles during the Soviet regime, but has its roots in the country's oldest history. Even if these Franciscans were not beatified, with this picture, of which we have also made prints for private devotion, we want to respond to the duty of venerating those who gave their lives for our faith in this land". The Catholic presence in Kazakhstan is closely linked to the ethnic communities that arrived in the country with the Soviet deportations, but at the same time sees the number of local Catholics increase. In this regard, explains the Bishop: "This year we intend to start catechesis on the Christian proclamation in Kazakh language. The Russian language is very widespread in Kazakhstan, so we guarantee pastoral service in this language, but now the need arises for a Christian proclamation in the Kazakh language: we will see what fruits it will bring, but it is an important sign for our local Church" .